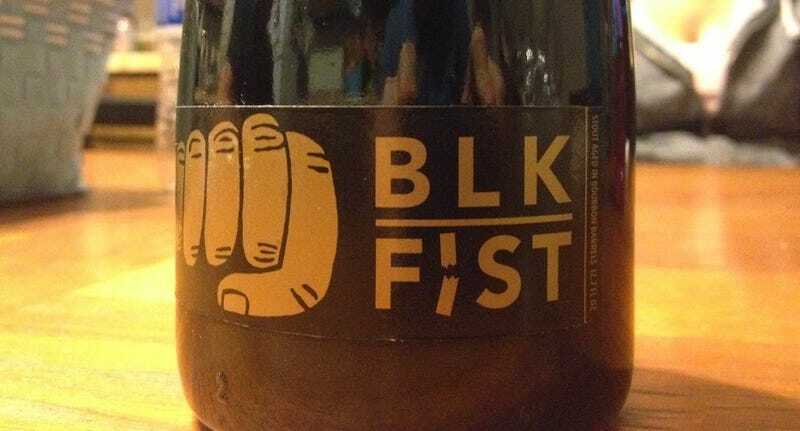 If ABV% was a race, Mikkeller's Black Fist would be a marathon. Last night, thanks to my brother, I was able to try a beer which I would never have bought. Mikkeller's Black Fist Stout aged in Bourbon Barrels. At around $25 for a 12.7 oz bottle, this is priced so far beyond the pricelines which I follow, that I would just laugh at it. Fortunately, I didn't buy it, my brother did. And for extreme alcohol by volume (ABV) brews, this one is priced accordingly. Because it is 26.1% ABV (yes, it is 52 proof beer). That's not a typo. And it's specifically what Mikkeller was aiming for when they brewed it. First impressions of this beer. It smelled like what I imagine a roasted malted bourbon would be like. Boozy, heavy, sweet with a bit of soaked oak in the nose. Initial taste was nothing but bourbon, dark roasted malt/coffeee, and boozy sweetness. Finishing with more nearly burnt malt flavors, and a dark unsweetened chocolate flavor. But with remaining hints of sweetness. This was nothing like I have ever had before, and I've had a lot of weird stouts and a lot of high ABV brews. Mouthfeel was dense and heavy, with a smooth velvety feel. Overall, I enjoyed it, my wife (who loves dark heavy stouts and a good whiskey or scotch) was perplexed and my brother thought it was something that he was glad he tried. We all agreed that it would make a most amazing sauce or ingredient, if we were all filthy rich and didn't mind paying $30 for a single ingredient in a reduction sauce. Additional notes, while we didn't let it breathe for an hour and a half, we did let it sit and get closer to ambient temps. Place of Purchase: Tap and Bottle, Tucson, AZ. Bottling Date: Didn't notice or see one, however they released it on October 8th, 2013, and it was a single batch as best as I can tell. So it was from that.